The U.S. economy has come a long way, but the Federal Reserve's decision on rates could still be swayed by data before its December meeting, according to the country's top central banker. Federal Reserve Chair Janet Yellen spoke Wednesday before the Economic Club of Washington, ahead of her economic outlook testimony in front of Congress on Thursday. Economic data has not necessarily been playing ball with the Fed's policy plans in recent weeks and has been mixed at best. While construction spending has risen, there has been a sharp downturn in the manufacturing surveys along with weaker retail sales. Yellen said economic data since October has been consistent with expectations of an improved job market, and she expects continued moderate growth, but she allowed that data released between Wednesday and the mid-December policy meeting could change the outlook. "Between today and the next (Federal Open Market Committee) meeting, we will receive additional data that bear on the economic outlook," Yellen said in her prepared remarks. "When my colleagues and I meet, we will assess all of the available data and their implications for the economic outlook in making our policy decision." U.S. stocks were little changed on Yellen's comments, but currencies moved on the news. The euro fell to a fresh 7½ month low against the dollar, and the greenback extended its gains against the Yen. 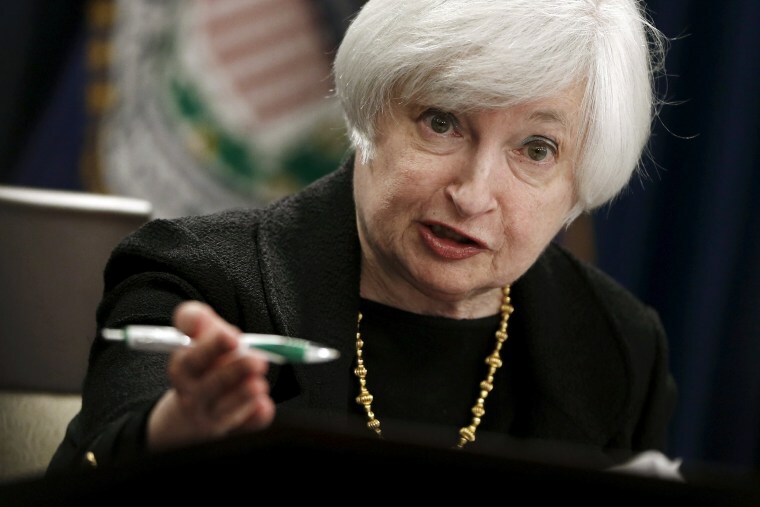 The Fed chair said she sees continued growth sufficient to boost jobs and raise inflation. The job market, she added, is close to the Fed's maximum goal, but she can't yet declare full employment. Job growth has been relatively strong and Friday's employment report is expected to show that the U.S. economy added about 200,000 jobs in November. Data on Wednesday showed U.S. private employers added 217,000 jobs in November, up from the 196,000 in October. Economists polled by Reuters had expected an addition of 190,000 jobs. The data could be an indication of the more comprehensive non-farm payrolls expected later in the week. Are We Done With ‘Rock Star’ Central Bankers? There has been less progress, however, on the inflation front, she said, but she forecast that drags will diminish next year. Turning to the Fed's future rate decisions, Yellen said it will be appropriate to be more cautious on raising rates from near-zero, and the Fed must take into account the lagging effects of its policy. "When the Committee begins to normalize the stance of policy, doing so will be a testament, also, to how far our economy has come in recovering from the effects of the financial crisis and the Great Recession," Yellen said at the conclusion of her prepared remarks. "In that sense, it is a day that I expect we all are looking forward to."